“Eat your vegetables” is time-honored advice for anyone looking to improve the quality of their diet. But for some people who don’t have easy access to fresh produce, preparing and eating healthy meals can be a challenge. 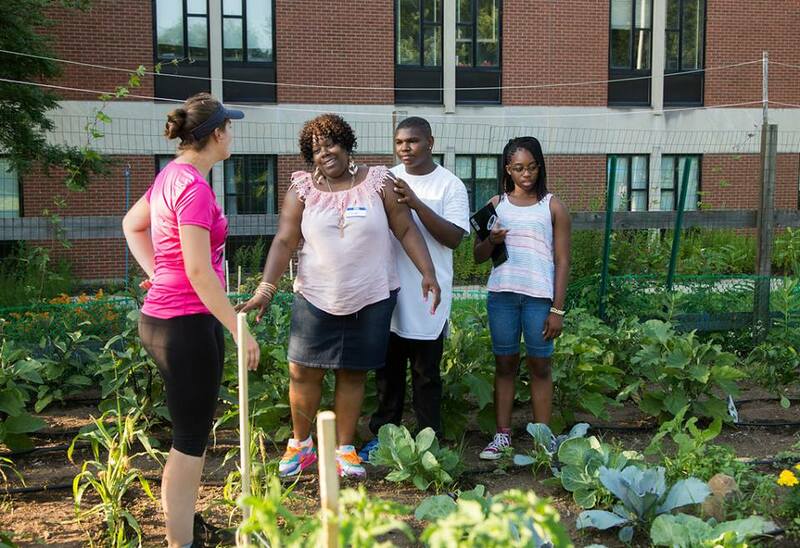 This summer, area residents who wanted to learn about growing fresh fruits and vegetables, nutrition, and healthy cooking were able to take part in a campus outreach program developed and run by the Sustainability Office and CARE (Community Alliance for Research and Engagement), assisted by New Haven Farms (NHF). 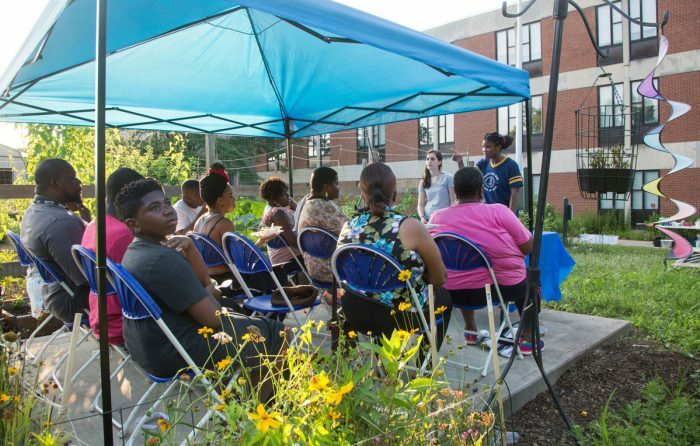 The program involved improving the university’s organic garden, located near Davis Hall, while teaching participants about growing and preparing produce from the garden. 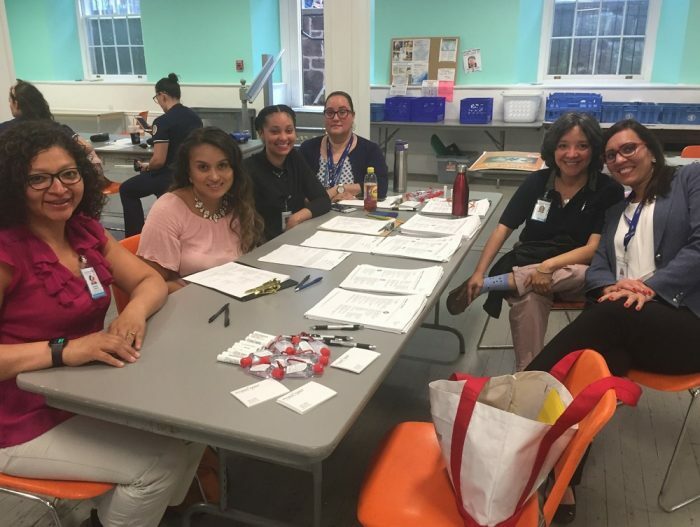 Sessions took place on six Tuesday evenings, from early July through mid-August. Suzanne Huminski, coordinator of the Sustainability Office, and Alycia Santilli, director of CARE, teamed up with a few of their interns to establish the community garden education program. Santilli says that CARE “dedicated some limited grant funds to consult with New Haven Farms and expand the growing capacity of the garden.” Two public health interns planned and piloted the garden-based nutrition education program, which was based on New Haven Farms’ more extensive health education curriculum. Two Sustainability Office interns cared for the garden and worked with participants on growing and harvesting vegetables. 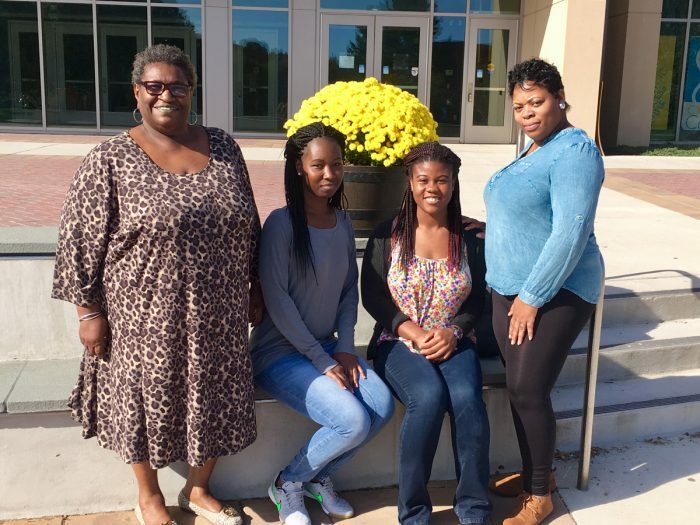 Families from low-income communities that surround Southern were invited to take part in the program. New Haven Farms’ 16-week garden program is open to people who are referred through a health center, Santilli explains. For instance, individuals at risk for diabetes might be referred to the program so they can learn healthier eating habits. “We’ve adapted their program to ours,” Santilli says, “but ours is not connected to health centers or prescriptions.” Sustainability intern Kaelyn Audette visited New Haven Farms to learn about the garden program and bring back what she learned to Southern’s garden. 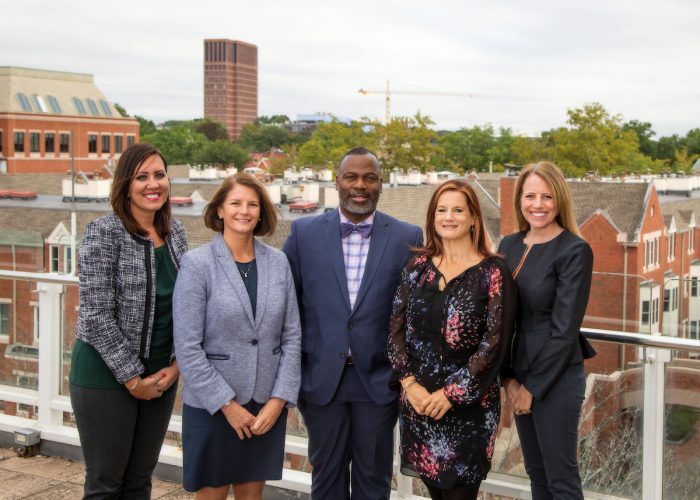 Abby Putzer and Meadeshia Mitchell, both graduate students in public health, went to NHF once a week starting in May to help with NHF’s health education program, so they could understand how it works. A core group of about seven participants came every week. The program was an opportunity for the interns to work with community members and to learn how to manage a project themselves. In addition to nutrition education, garden tours, and cooking demonstrations, participants received free produce from the garden. And the garden is now so productive, thanks to Audette and McNivens, that the Sustainability Office is also able to continue making donations to the St. Ann’s soup kitchen, which it has done for years. “Our goal was to double the produce in the garden so we could continue donating to the soup kitchens but also give a bag of produce to each of the participants,” says Huminski, and the goal was met. She says 363 lb. of produce was harvested from mid-July through early August, and the yield is expected to increase through September. The weekly garden tour was exciting, says Audette. Many of the participants don’t have a yard, so they can’t have a garden, and they enjoyed watching the vegetables grow. Teaching people to eat more healthily – how to use different vegetables and make healthy food choices – was gratifying, the interns say. 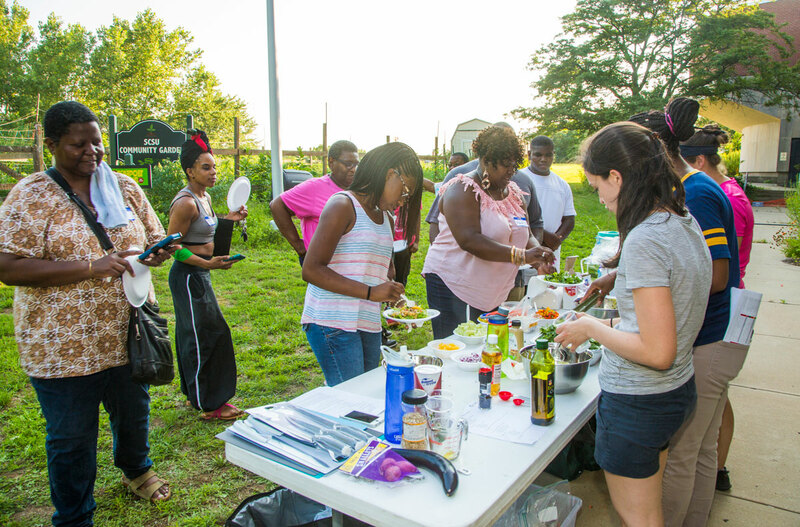 Participants got to see vegetables go from farm to plate, and they enjoyed taking home what they learned and sharing it with their families. “It was fun to see them come excitedly each week to show what they’d learned,” says McNivens. Audette graduated in May; she majored in public health and plans to go to graduate school. McNivens is a junior psychology major. Putzer and Mitchell are MPH students, and this project was part of their practicum. There is a demand in urban neighborhoods for fresh produce, Santilli says, and beyond the community garden program, participants can continue to eat healthily even if they don’t have a yard where they can grow vegetables. 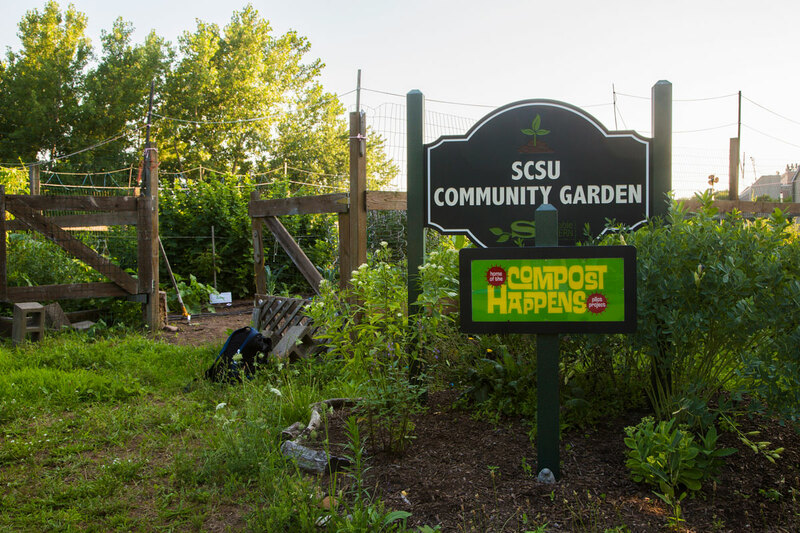 New Haven has a network of about 50 community gardens where residents can grow their own produce, and farmers markets and farmstands around the city, as well as a mobile pantry through Connecticut Food Bank, offer fresh produce. See more photos from the campus garden and community garden program.